When you purchase an AB Traps Humane Trap, you can be certain that you are getting a high quality product that works. We are registered with the USPTO and our products ship to you directly from Amazon's fulfillment centers. Beware of counterfeits and low quality replicas. Only purchase authentic AB Traps Brand Humane Traps! 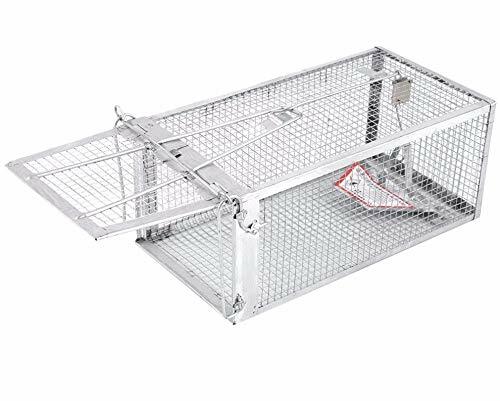 This AB Traps Humane Trap measures 10.5" x 5.5" x 4.5" and is suitable for catching small to medium sized rats, mice, and similar sized pests. For larger pests we recommend one of our larger size traps. Our patented humane animal traps are a safe and effective way to capture that pesky rat, mouse, or other live animal without injuring or killing them. Our traps do not use poison or glue and are safe to use around children and pets, indoors or outdoors. Our humane no-kill traps are designed to be reliable and reusable for catch and release of live animals. Very simple and easy-to-use, the trap sets up in seconds and instructions are included. If you have any questions about this product by AB Traps, contact us by completing and submitting the form below. If you are looking for a specif part number, please include it with your message.